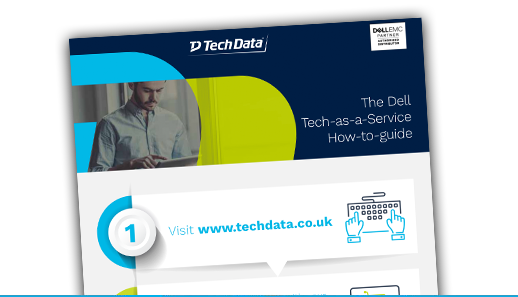 Maximise operational efficiency, reduce upfront IT investment and gain faster access to the latest technology by purchasing Dell products through Tech Data’s Tech-as-a-Service (TaaS). TaaS lowers the financial barriers to entry for new installations and allows for frequent Dell device refreshes by providing flexibility and scalability that traditional procurement does not. The services based, pay-as-you-go model combines hardware, software and services to meet your customer’s technology needs while satisfying their budget requirements, with no need for large upfront investment. Analyst firm IDC suggest moving to an ‘as a service’ model such as Tech Data’s TaaS shortens refresh rates on client’s products by an astounding six months. Further benefits include moving from capital expenditure (CapEx) to operational expenditure (OpEx) and reducing IT workloads by offloading tasks related to procurement and management. Simply generate a quote at techdata.co.uk and a price will be provided for all the items in your basket, this quote will then be honoured for a further 30 days. You will receive instructions on ordering your customers’ equipment, the Tech-as-a-Service team will then support you in delivering the tailored solution to your customer. The TaaS team ensures funds are dispersed correctly to you and equipment is delivered to your customer. During the life of the contract, the TaaS team work closely with you to add more hardware, software and services to the customer’s framework contract.